Think of a task, a discipline, a project which you love and to which you dedicate yourself. It could be a relationship; it could be something artistic; it could be a sporting achievement; it could be a qualification for which you long. It doesn’t matter what it is as long as it’s something to which you regularly give much energy and commitment and in which it is hard to become proficient. In the realm of professional sport one of the hardest disciplines (if not the hardest) is hitting a baseball. Specifically: hitting a baseball for a home run at major league level. If you take the technical definition of a successful hit then the reality of how hard this is will come home to you. You do not merely need to lay 2.75 inch diameter and 42 inch long bat on 5 ounce, 9 inch circumference ball at speeds of 90+mph. You need to put the ball you have hit in play, in the wide ‘v’ in front of the hitter. You also need to do so in such a way that you do not get out – caught or beaten by a fielder’s throw to the base to which you are running. A good major league hitter will, over a career, achieve this about a third of the times he takes to the plate. This means that the best fail at what they are paid to do two-thirds of the time. Imagine failing at something you love two out of every three times. You’d have to be strong to cope with that, wouldn’t you? A home run is still harder. You need to connect with the aforementioned ball in such a way that if flies the 300 plus feet to the field’s edge and clears the wall there within the legal zone. A really good major league hitter, over the course of a 162 game season, will hit around 40 or more home runs. Baseball is America’s game of myths and legends. It’s not the commercially dominant one – that status belongs to (American) football. But it is the one in which a nation continues to find at least a good part of its meaning. It gives rise to notions and phrases which have spread the globe: three strikes and you’re out, curve ball (not curved ball as some of my friends keep saying), touch base, step up to the plate; all of these are phrases which have entered parts of the global cultural lexicon with ubiquity. A home run or hitting it out of the park are concepts we can grasp – it’s something monumentally successful which is very hard to achieve. To do so in the context of major league baseball takes athletic power, almost supernatural levels of hand-eye co-ordination, a cool head under pressure in order to know when to go for it and when to refrain, and an elusive dash of luck. I’ve always liked American sports. I have little time for the lazy ignorance which assumes that the stop-start and heavy padding of football means it’s not physically intense. As the ex-England rugby captain who trained with a football team will tell you, it’s the most physically intense sport there is. Including rugby. With an extra serving of the strategy and tactics of chess reinvented as a blood sport. As for those who dismiss baseball as rounders … well, by now you should have got the point. 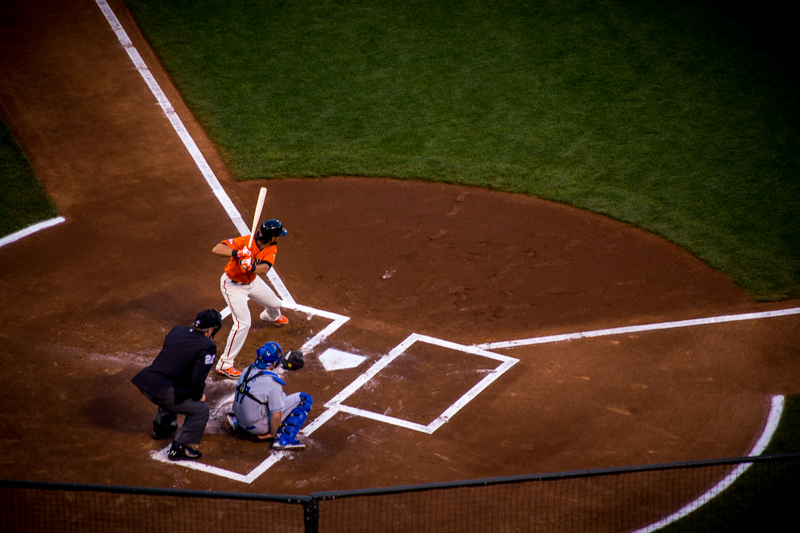 So as we do when we visit my sister near San Francisco, we recently managed to see our baseball team – the Giants – live. Last Friday was my fourth live baseball game, each time seeing the Giants. I’d never seen a home run, and was of course longing for one. What we got was a special night. My wife and I, my sister and her husband, two of their three kids and my sister’s friend were off to see the San Francisco Giants. This is a successful team, winning two of the last three World Series; success can breed passionate fans and sell out crowds. We had tickets for a game with the Giants’ bitter rivals, the Los Angles Dodgers. Over the long season they play each other 15-20 times, and each one is broiling mass of emotion and passion. A sell-out 41,000 crowd on an early season, early summer San Francisco evening saw a low-scoring game defined for the most part by the Giants hanging on in on a game from which they should have been dismissed. Hang in there they did. Low scoring in baseball usually implies two good teams and a bucket-full of tension; it was that, though in truth the first portion of the game was characterised by Giants errors from which the Dodgers should have made more capital. Good teams hang in there, though; so we entered the 9th and final inning with the scores level at 1-1. If a winner didn’t emerge, which seemed unlikely, we’d head for the potentially endless torment of sudden-death extra innings. The Dodgers, batting first, failed to score, stymied by Sergio Romo, the Giants’ electrifying close-out pitcher (meaning he specialises in finishing games – the pitcher who starts a game will never finish one; it’s just too long). Up came the Giants’ hitting line-up, to this point this evening stutteringly ineffective. With extra inning beckoning, Buster Posey came to the plate for the Giants. One pitch, one perfect connection. 41,000 stand watching the white ball describe a high but fading arc against the night sky. Go on. Go on. Go on. The arc dying over deep left field, it seems to gain a new lease of life. On it goes, over the fielder, somehow over the wall. Home run. Game over, home team victory over bitter rivals in the bag. 41,000 (minus a few Dodgers fans) erupt in a spasm of joy. Posey jogs round, dives into his team mates at home plate. I have now seen a home run. One game out of a 162 game season, more if the Giants make the play-offs as expected. Pause for a moment and think, though: what is going on in that moment of last-minute perfection? It’s easy to criticise sport, especially if you seek to follow Jesus. Sport can obsess; it can and does become an idol, elevating money and celebrity at the expense of the ordinary and every day. To see only that misses the point. In a moment of near-perfection achieved, of a game irrefutably won, we in the stadium and watching or listening elsewhere are purely and simply caught up in the moment. Now to live purely for the present is another trap we Jesus-followers must avoid; we are called to see behind and beyond, to think and act with our eyes on eternity. But to do so, crucially, in a way which leads us to be present to the moment we are in. Giving it our full attention and focus; weeping or laughing or thinking or stopping or whatever is required to be done as fully as possible, then moving on. Not living in it, but fuelled by it, seeking to point ourselves and others to the eternally bigger reality of which this present moment pulls back the curtain. It is, to use the words Jesus spoke, ‘not worrying about tomorrow for tomorrow will worry about itself...’. Playing and following sport, if done well, allows us to consider the lily of the moment in front of us, to maximise it, to drink fully from it, to relish it and move on. For the Dodgers fans, it allows the same – in sport as in the rest of life, for those on the mountain top are relatively few. Most of us are down in the valley somewhere. For me, and for others that Friday night, we had a mountain-top moment of perfection, joy, euphoria, hope fulfilled. Most of my life I am not there. That much is true for most of us most of the time. Sport, when seen with the eyes of eternity, can help light and elevate the soul with moments of prowess and beauty and achievement; aware that most of the time we are reaching and grasping for it, falling short in the two-thirds majority moments of failing even at that to which we are most devoted. So, consider the lilies: the cricket, the soccer, the rugby, the ball-game, the coffee, the painting, the child, the lesson-plan. For even in the two-thirds moments of apparent imperfection you will, if you stay present enough, see eternity’s curtain pulled back just a touch; enough to give you fuel for the journey onwards, upwards, downwards, on the level. Whatever the elevation, it’s still forward. Scroll down for some of my wife’s brilliant photos of the night, and down further still for a link to her full collection of photos of the game. If you’re not yet convinced by the romance and beauty of baseball, or just fancy a good watch, then I strongly recommend two wonderful films (which will I promise make sense to the newcomer). First and most importantly, the beautiful and beguiling Field Of Dreams. Then the more recent, more factual but no more real, Moneyball. To see more of Bev’s photos of the evening click here.